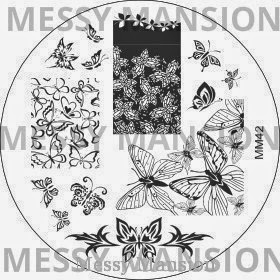 Lacquer Lockdown: Hot Off The Stamping Press: New Messy Mansion Nail Art Stamping Plates! 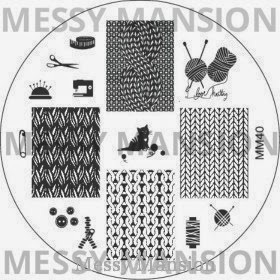 Hot Off The Stamping Press: New Messy Mansion Nail Art Stamping Plates! 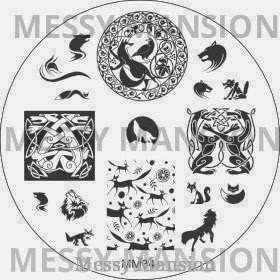 Foxes and Hounds plate was one that I previewed a while ago. This plate is so cool and unique and one of the many examples of why I continue to love and purchase Messy Mansion plates. Vintage Flight. How adorable right? I love the tiny little Zeppelin plane in the top left corner! Knitting. Another pate that was announced a while ago. I was really looking forward to this one because of all the knitting needles and bundles of yarn! So what do you think? More beautiful additions to the line up right? I also forgot to mention MM01-20 plates have also restocked! 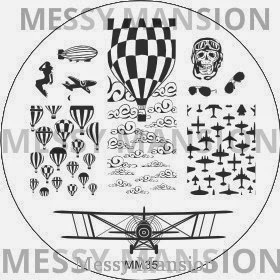 Messy Mansion plates retail for $7 USD per plate and will ship from the US factory in North Carolina. Right now I don't know if shipping is still being offered from Australia anymore for the rate of $2.50, but the cost of shipping for a single plate is $5.75, two plates is $6.50, and all 4 plates it will be $8. In short the shipping is a bit steep for the US based ladies despite the plates now being located in the US. The good bit of news is that if you purchase over $100 in products then shipping will be free. Don't forget with the Pro Sets restocked and the other stampers as well as storage and polishes this might be easier for you to accomplish than you think! Lol though personally I'll be holding off a bit in hopes of the return of direct shipping or until more plates are released to offset the shipping costs.